Recent research shows the earth has undergone a remarkable cycle of warming and cooling over the last 400 thousand years. 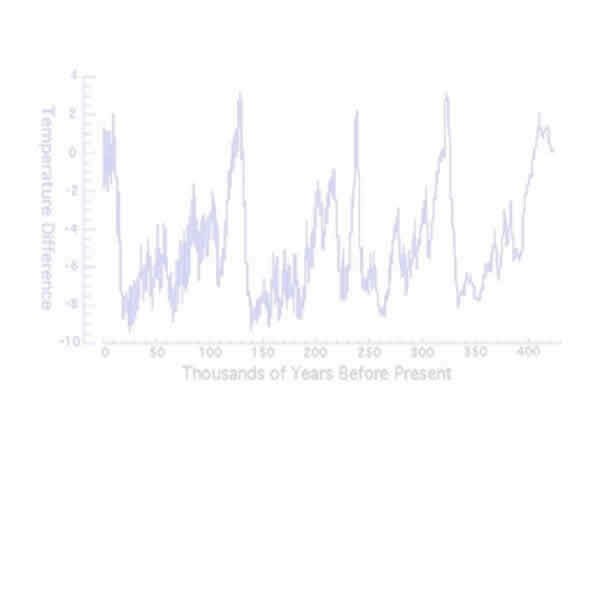 It warms up fairly quickly over a 10 thousand year time frame, and then undergoes a slower period of cooling that lasts for about 100 thousand years. This cycle has repeated itself 4 times in the last 400 thousand years. We appear to be approaching the end of the period of warming. 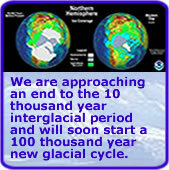 The melting of the northern polar ice cap is the main driver of this cycle. Once it is significantly melted, weather patterns irreversible change and a new glacial period begins. 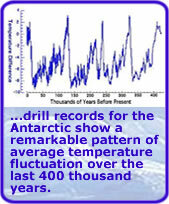 Earth has been in an inter-glacial period (warming period) for over 10 thousand years now. Most of the ice shield over North America and Europe has already melted except for Greenland. The oceans have already risen an estimated 120 meters and would rise another 6.5 meters if most of the ice on Greenland melts (as it did in the last interglacial period). Thanks for visiting our site. Global warming and how we deal with it is a very important issue to be discussed. Is this happening independent of what mankind has done to the environment? Will mankind speed or slow this process? Can we make a difference or is this simply an overwhelming force of nature that we have to adapt to. Your participation in this public message board discussion is one way to bring understanding to this issue. Please leave any comments, or links to related information you feel are important to the message board. Note: The information contained here is the opinion of the site builder. The messages contained on this site are only the opinion of the poster and are no substitute for your own research. Copyright © 2009 IsCanadaReady.Com, All rights reserved.